I have a lot of respect for stories that lay out the pieces and then use all of them. A good example recently is Guardians of the Galaxy, in which the protagonist’s motivation is entirely represented by a cassette tape (scenes of which neatly bookend the movie). John Lasseter’s films for Pixar and Disney also tend to be very good at this; the villains are driven by a motivation that seems obvious in hindsight, and the heroes save themselves not by finding a convenient gadget but by discovering something about themselves. Nothing’s left on the table. Nothing’s pulled out of thin air. Plenty of room for foreshadowing and plenty of opportunity for the themes of the story to be suggested and interpreted instead of stated outright. Lasseter’s stories are often themed around toys or monsters or racecars or Santa’s elves or other kid-friendly subjects, but the messages apply to all ages. A story which lacks the finesse to handle this well – in which things just happen, and people just react – is just a kids’ story. Big Hero 6 is a kids’ story. Meanwhile, the story as a whole is about two people who have each lost a loved one. The bad guy seeks revenge, while the good guy renounces it … except, no, the good guy doesn’t really have any reason for revenge in the first place. He lost his loved one through an accident, not because of any meaningful action on the part of the bad guy. What caused that accident, anyway? (We never find out.) And why is the bad guy so dedicated to revenge? We only met him in one scene before he was revealed to be the antagonist. He didn’t look like he had a dark side. He didn’t even have time to mention this person who supposedly was his entire life, whose loss drove him over the edge. It reminded me a little of Frozen, in which – at a pivotal moment in the story – one of the characters all but says, “Guess what? I’m the bad guy,” with absolutely nothing leading up to that revelation. Don’t get me wrong – the film contains a handful of moments of pure joy: the first visit to the “nerd school”, Hiro’s demonstration, and Baymax’s first flight. These made the film enjoyable. But I’d also like to have seen teammates and an enemy with real personalities and motivations, and I also wanted to see Hiro take something he learned earlier in the story and use it towards his final showdown with the bad guy. Without that, everyone’s just reacting. I expected more than that from a film with Lasseter’s name on it. Plenty more tasty selections, but I’m saving them for next time! It was a fairly busy evening, but still we ran into our friends Steph and David on the bridge between UK and France, and spent some time catching up with them. I love that we can be surrounded by tens of thousands of strangers and still find people we know. Then Jill and I caught Richard Marx’s last show of the day. Sometimes Jill can’t remember what she had for dinner last night, but she can always remember the words to sing along to eighties songs. The concerts at Epcot are always excellent and this was no exception. 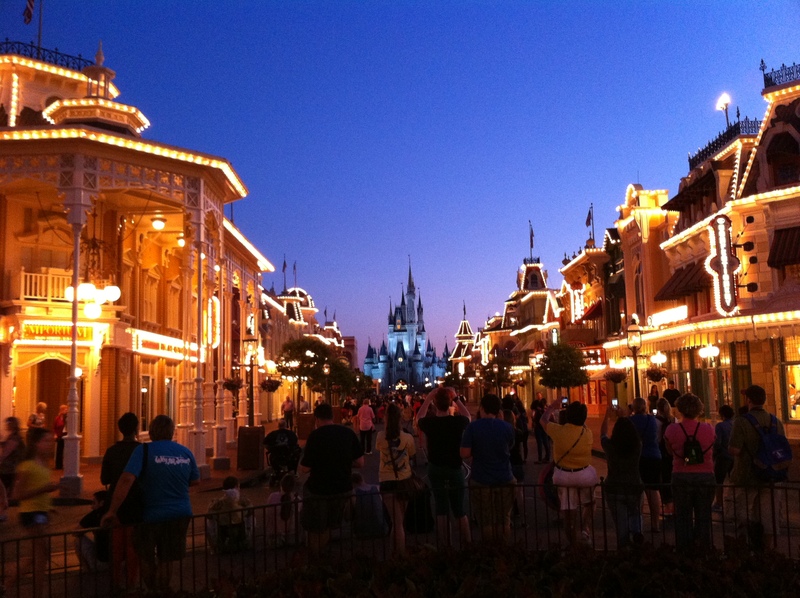 On May 24, Disney held an “All-Nighter” event at its parks. From six in the morning on Friday until six in the morning on Saturday, the Magic Kingdom, Disneyland Park, and Disney California Adventure would be open. Twenty-four hours, straight through! And of course Jill and I had to be there.